So, you’ve completed your analysis. You now understand everything there is to know about your firm, the market in which it competes, and how you anticipate the future might unfold. Well, maybe not everything, but as much as you reasonably can. The next step is to develop strategic options for taking the firm forward. Options are simply things you could choose to do or not do. Contrary to popular belief, you don't have to rely on vague notions like 'blue-sky thinking'. Nor must you simply hope that inspiration strikes like a bolt from the blue (although a little inspiration never hurt anyone!) 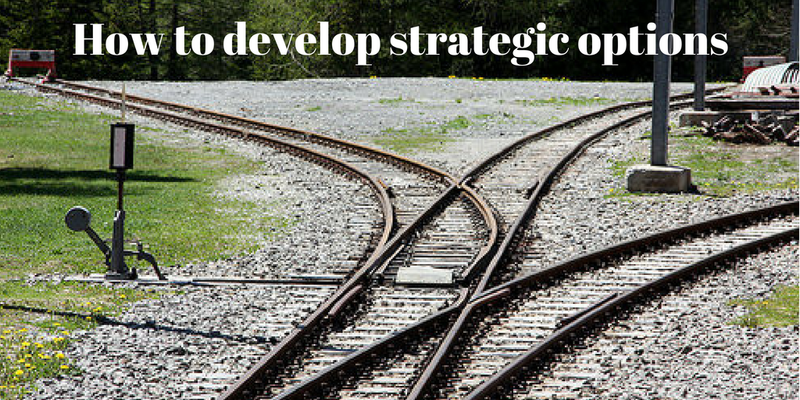 In contrast, there are specific processes you can undertake in order to develop strategic options. Use Ansoff’s matrix to consider all the possibilities of selling existing products to new customers (new geographies, customer segments, etc), new products to existing customers, or even new products to new customers (learn more). Use the innovation templates for a systematic approach to developing new products and services (learn more). 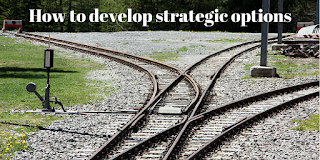 Use Porter’s generic strategies as a framework for choosing between and developing options based on either Cost Leadership, Differentiation or Focus (learn more). Add, change or remove a competitive factor on your Strategy Canvas (learn more). This best done using the Voice of the Customer (VOC) off the back of customer research. Develop options which flow directly from the insights in your SWOT analysis (see below). For a portfolio of businesses or products, use a BCG Analysis (learn more) or a Pareto Analysis (learn more) to understand and develop your options for shaping the portfolio. Ask people for ideas (see below). Look especially for examples where your strengths play into opportunities, and take evasive action where your weaknesses most expose you to threats. In addition to using the other techniques, don't forget the simplest one of all: just ask people what they think you could or should do. You could ask colleagues, customers, distributors, suppliers, and, of course, professional consultants. When doing so, it is best to follow the brainstorming guidelines of suspending judgement of those ideas until later. Here are some tips to ensure your options allow for real choice. Don't just stop once you've found an option you like. If you'll do, you'll never know if the next option would not have been even better. Work through the full range of options. Look for options which are mutually exclusive and/or involve tradeoffs. This will help to ensure you're making the really tough calls to differentiate yourself in the market, and not simply executing as many of the ideas as you can. For example: Airline brands must typically choose to position themselves as either 'discount' or 'premium'. For example, by eliminating meal options, discount airlines can reduce flight turnaround times and reduce costs (well beyond the cost of the meals themselves). However, this would deter premium customers. Far from being a limitation, such mutually exclusive options are strategically valuable as they allow different competitors to take up different positions without competing head-on. Hobson's choice creates the illusion of choice by positioning one option as an alternative to either doing nothing or failing. I've seen people do this when they only really have one option (see tip 1). For example: We must replicate a competitor's last move or lost market share. What else could you do to retain and even grow market share? When faced with a large number of options, group mutually reinforcing options into themes. Strategy is a pattern of decision making, rather than a number of decisions made independently of each other. Grouping options into themes can help to highlight those patterns. Some options can be included in more than one theme. In extreme case, themes can have their own vision and mission statements. Values, however, should remain consistent across all the options and themes. Theming options presents you with two levels of choice: which themes to pursue / not pursue, and which options to pursue / not pursue within them. Resisting the temptation to judge options as either good or bad too early in the place will cloud your judgement. An option which does not appear very good in isolation might be a vital component of a very powerful theme. Once you're done, you're ready to move on to the next step: How to evaluate and prioritise strategic options.